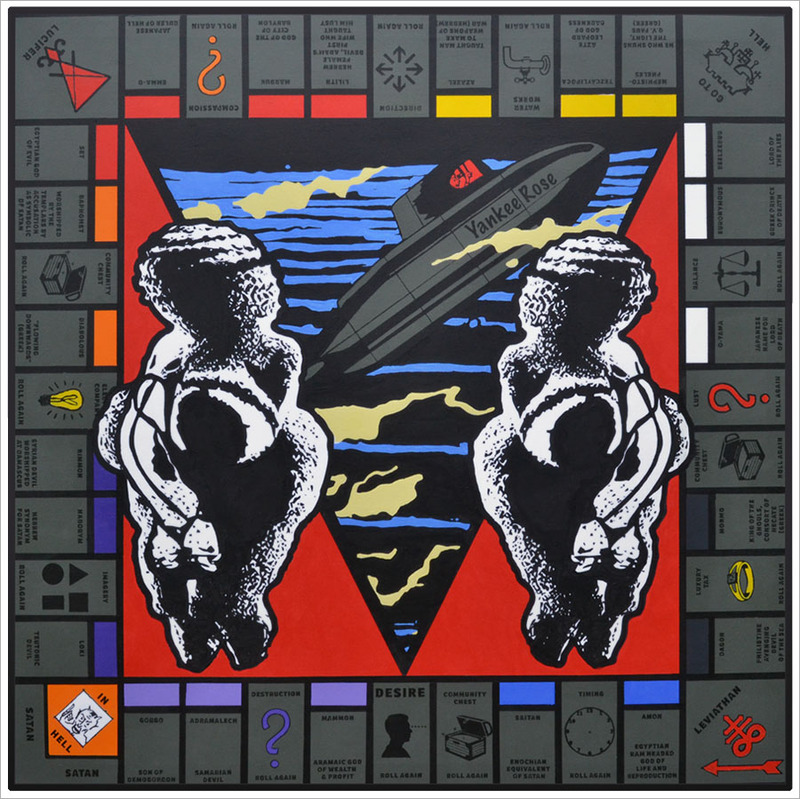 The “Twin Poisons…” comprises a square board, similar in form to the well known Monopoly™ board. [Monopoly™ being originally conceived as a way to demonstrate the evils of land ownership]. “The Twin Poisons…” shows all the glories of materialism along with the Infernal Names found in Anton LaVey’s Satanic Bible (1969) replacing the property names on the original Monopoly™ board. Destruction, lust, the Elements and the four Princes of Hell, all are on the gridded perimeter along with other ingredients needed for the participation in taboo play. The central image shows ‘twin sisters’, stylised Baphomets and living ‘sins’ glorifying the carnal and the material. The central composition is an inverse triangle showing the individual in his/her submersible rising from the forbidden depths of the unconscious like a muscular erect phallus. The whole composition springs forth from the large black letters and single black figure in profile at the base of the painting spelling the word DESIRE. And this is the source of its power where one can revel in the friction that Desire brings and accept the pleasure and pains that come from making ones dreams come true. See also: ‘Damnation Games’ (2014) by Fergal T. Fitzpatrick.